We all come from different backgrounds and experiences, and we’re all working with different brain chemistry and physical limitations, I know. But the idea of a companion, Pain, that accompanies me wherever I go, is one I can relate to. I came to a creative life, years ago, as an antidote to grief and depression, and as a means to quiet the noise in my head. While that particular period of my life has passed (the noise is forever there), I 100% believe in the mental health benefits of working with my hands. Still, my older self knows there’s another way of looking at it. I paired this month’s quote and stamp because the quote I chose (unlike the one above) acknowledges the tension between the face we present to the world and a more private one, without positioning one or the other as “real” or “true,” or even as separate entities. They are both real but, like the iceberg, only a fraction of who we are is ever visible to others. Remain aware of what I am. The work we do to examine our life, to pick it up and turn it around and look at it from many angles—in other words, to make sense of it—is to me the basis of our mental health. There are other factors, of course, but a willingness to look, to find out “how far beneath the wave I go,” is both a good way to start and a lifelong endeavor. 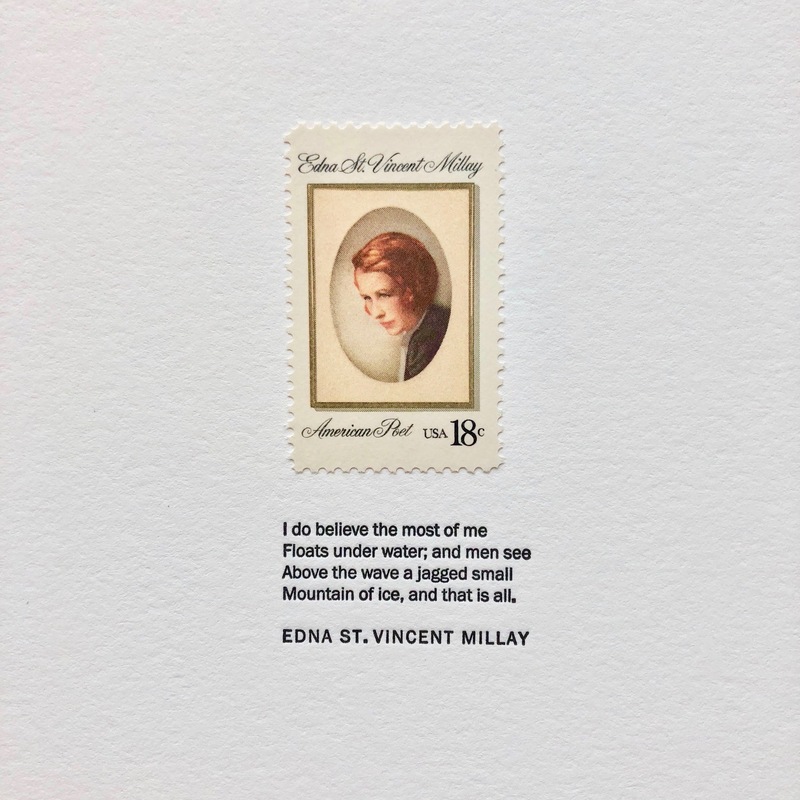 Notes: Edna St. Vincent Millay was a beloved poet in her time, a feminist and a political activist. She was the third woman to win the Pulitzer Prize in poetry, in 1923, when she was 33 years old. If you’re interested in reading more of her poetry, I recommend starting with her first published poem, “Renascence,” which made me cry the first time I read it.